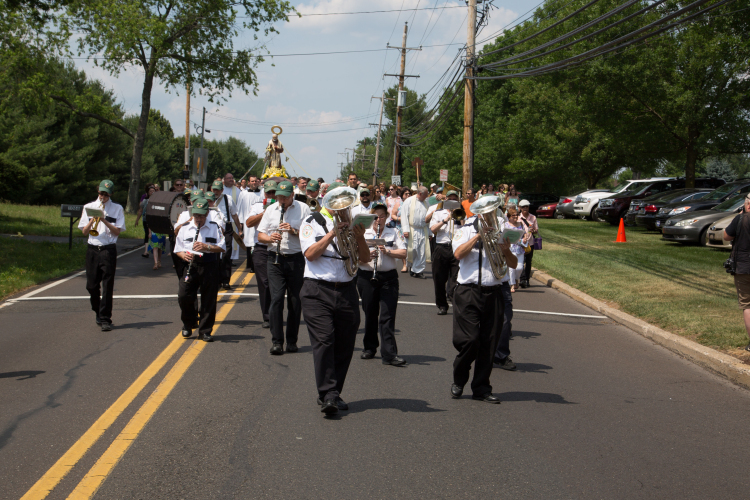 A neighborhood street procession, accompanied by the Verdi Band of Norristown, will take place after the 12:30 p.m. Mass at St. Bede Church in Holland on the final day of the Padre Pio Festival June 25. A new tradition continues on the weekend of June 23- 25, when St. Bede Parish in Holland will host the second annual Padre Pio Festival. It features a special Mass, a procession in the neighborhood surrounding St. Bede Church and also includes music, food vendors and craft tables. “Many people of all ages, both in our parish and beyond, have a strong devotion to Padre Pio,” said Msgr. John C. Marine, pastor of St. Bede’s. Last year’s inaugural festival hosted pilgrims from around the tri-state area and beyond. St. Pio of Pietrelcina, better known as Padre Pio, was canonized by St. Pope John Paul II on June 16, 2002, which is why the festival is celebrated this month. Known for his trademark phrase “Pray, hope and don’t worry,” Padre Pio’s life was marked by his piety and charity. He is also known as the patron saint of young people. To that end, this year’s festival has been expanded to include a special evening devoted to youth and young adults on Friday, June 23. The festival schedule for Saturday, June 24 begins at 2 p.m. with the craft show, food vendors and musical entertainment kicking off the day. There will be a 5:30 p.m. Mass, also with blessings with the relic. Sunday festivities start at 11 a.m., with a special Mass at 12:30 p.m. followed by the procession. The craft vendors, food vendors and entertainment will continue throughout the day. For the second straight year, the festival will present classics/disco/dance singer Jessica DiDonato and Sinatra tribute singer Stephen Ritrovato. This year guitarists Bob and Rob Tomlinson will play tunes from the 1960s, ‘70s and ‘80s. Kids can visit the children’s pavilion and play on the inflatable amusements. The cafeteria will offer specialty coffee and baked goods at the Pio Cafe. Religious items and a gift basket raffle will also take place. The faithful can participate in a special healing service after the procession, and priests will hear confessions throughout the day on Sunday. The festival of faith and fun will conclude on Sunday at 7 p.m. Plenty of free parking is available on the parish grounds. Tour buses are welcome. For more information on the Padre Pio Festival, call the St. Bede Parish Office at 215-357-5720, or go online to padrepiofestivalhollandpa.com.